Situated in the southernmost region of Istria, Pula is the biggest town in this part of Croatia. It represents administrative, cultural and tourist centre of the region. With its three millenniums long history, numerous sights and monuments, a variety of beaches, diverse nightlife and quality accommodation, Pula is among the most popular vacation destinations not only among Istrian tourist resorts, but in the entire Croatia. Long history, dating all the way back to the prehistoric times, left numerous monumental traces of past cultures and civilizations. Although Pula was inhabited long before, ancient Romans are the first inhabitants who made significant changes. They brought the first wave of urbanization, building temples, villas; forts, ramparts, forums and theaters. 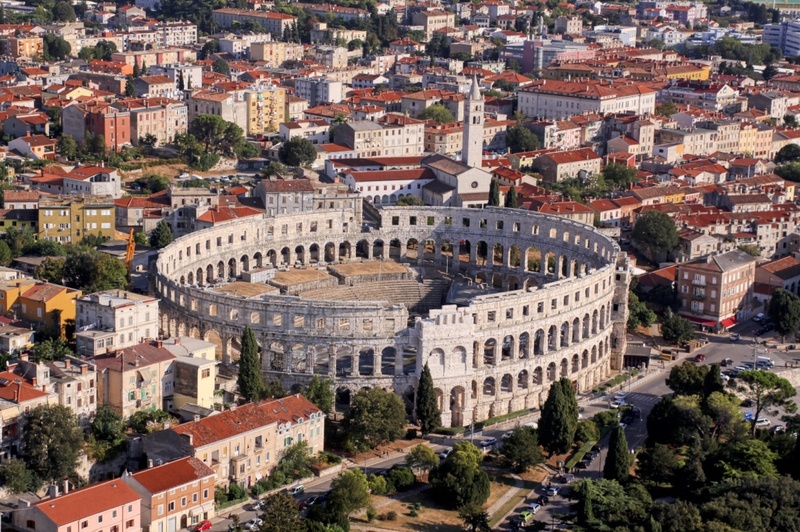 And of course, the symbol of today’s Pula, the Amphitheater, the popular Arena. During your obligatory stroll down the city center, be sure to visit Arena, former venue for gladiator fights; today the cultural center of the city where various concerts, festivals and events are taking place throughout the year. To complete your sightseeing, you should visit the ancient Forum with the remains of the Temple of Augustus; the Triumphal Arch of the Sergi Golden Gate and the Gate of Hercules. And to get professional and more detailed information, sign up for one of the numerous guided city tours. It is easy to reach Pula; whether you travel by car, by bus or by plane; the city has its own airport and is well connected with the rest of Croatia. Once you arrive, there is a rich choice of accommodation options to choose from: hotels, tourist settlements, auto-camps, hostels or private accommodation. And if you are arriving with your own boat, there are three marinas in the city area. Pula region is blessed with over 190 km of well-indented coastline almost completely covered with beautiful and diverse beaches, protected bays and romantic coves. The city itself offers a variety of beaches to choose from depending on your preferences and needs. For example, Ambrella is a typical Blue Flag beach with numerous services and activities. Havajsko beach is pebble-covered and suitable for children, while Valkane beach provides a special ramp for the disabled persons. The sea splashing all the city beaches is impeccably clear and pleasantly warm throughout the long lasting bathing season. And when the sun sets, the summer fun in Pula doesn't stop. There is a wide selection of nightclubs, cocktail bars and open air events throughout the summer season. Uljanik, Aruba, Galileo and Rock Cafe are some of the most popular nightclubs where you can enjoy various music styles and unique party atmosphere. Pula is the newly formed center of festival events on the Croatian coastline. Punta Christo and the Arena are hosting several electronic, jazz and reggae music festivals: Dimensions, Jazzbina, Seasplash, Outlook. The amphitheater of Pula also hosts one of the most important cultural events in Croatia, Pula Film Festival, where you can enjoy a selection of the best cinematographic achievements from all over the world. Be sure to explore the rich gastronomic offer of Pula. Local restaurants and taverns are serving a variety of exquisite and uniquely prepared dishes; from fish specialties, prosciutto and wild asparagus to specifically prepared Istrian pasta and delicious truffle dishes. The unforgettable and unique tastes of Istrian specialties will imprint the memory of a beautiful vacation in Pula long after you return to your usual life. Find information about selected Hotels, apartments and rooms in Pula to choose the perfect place for your accommodation.